The City Council’s Subcommittee on Zonings and Franchises voted yesterday to approve a proposal that would trade 110,000 square feet of Privately Owned Public Spaces (POPS) on Water Street to private developers. Although the Water Street Text Amendment will go before the full City Council on June 21, its passage in the subcommittee all but assures that the highly controversial measure will pass next week. A map of the public spaces under threat in lower Manhattan. The amendment will enable developers to build retail storefronts along 13 square blocks of the Water Street arcades (known as POPS) but the building owners will not be paying for the new spaces: Developers just will be on the hook for renovating the tower-adjacent public space and making the hardscaping stormproof. The Water Street arcades are a far cry from the ones in Walter Benjamin’s Paris, but the lower Manhattan spaces still serve a vital public function. Like all POPS, they were a quid pro quo that let developers build taller towers in exchange for providing publicly accessible space for as long as those buildings existed. In May, The Architect’s Newspaper launched a design charrette for the Water Street POPS to start a conversation around turning these mostly dreary and neglected spaces into vibrant gathering spots and successful corridors they once were. AN also provided testimony opposing the Water Street Text Zoning Amendment for a May 27 meeting of the Subcommittee on Zoning and Franchises. 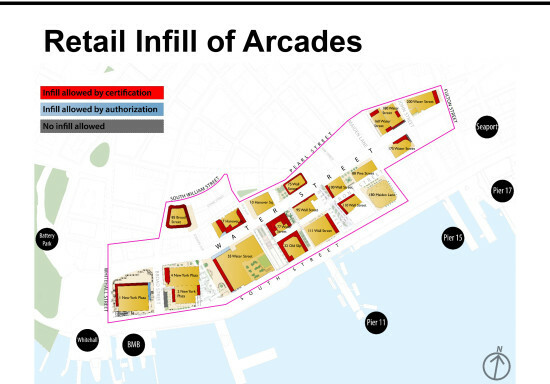 Modifications include an exception for arcades larger than 7,500 square feet to go through a Uniform Land Use Review Procedure (ULURP) review. 6 of 17 plazas will consequently be subject t0 a more intensive review before development. Other changes include limiting the frontage of drug stores and banks to 50 and 30 feet, respectively. Chin later expounded on her decision: “This wasn’t an easy decision to make. There have been many passionate voices that wanted this proposal to be rejected outright, or conversely, wanted the text amendment passed as is. 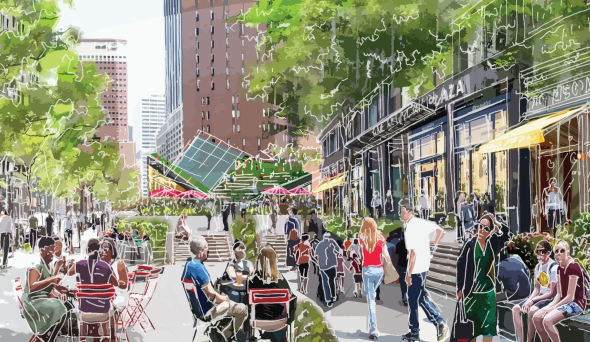 After much deliberation, I came to the conclusion that neither option would give our community what it desperately needs and deserves: Improved public spaces in plazas and arcades, small-scale neighborhood retail, and innovative indoor public spaces,” The Broadsheet reported. The Land Use Subcommittee is set to vote on the amendment today.